File Search with advanced capabilities for elasticsearch and wildcards! Easy Setup with auto-discovery of mailboxes, SharePoint sites, and OneDrive for Business accounts! Fast Self-Service Recovery allowing for restoration in seconds through an intuitive user interface! Multiple Daily Snapshots taking snapshots of your Office 365 environment up to 6 times per day to better prevent disruption due to data loss! Point In Time Rollback to allow IT Professionals to rollback to specific versions of SharePoint and OneDrive for business data files! Unlimited Retention with no caps on data or storage! Secure Backup using per contact AES-256 encryption and RSA 2048-bit public private key certificates! Aventis Systems is proud to offer 1 Year Subscription and Renewal licenses for Unitrends Cloud Backup for Office 365 and are delivered via Electronic Download for your convenience. Additionally, license levels are available to cover Email or Email, OneDrive, and SharePoint for complete coverage for most of your Office 365 data! 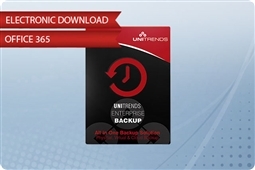 So shop our product option below and start protecting your business user data, email, and projects today with Unitrends Cloud Backup for Office 365!